So as many of you probably know, I didn't like the last Weezer record, another self-titled release otherwise known as the 'white album'. To me I found the lyrical arc undercooked and occasionally very questionable, the delivery underwhelming, and the production to be all over the place, not helped by bringing in producer Jake Sinclair who didn't seem to grasp the melodic subtleties in the groove that have always been Weezer's greatest strength on records like the Blue Album and Pinkerton and Everything Will Be All Right In The End. But I'll also be the first to admit that I was in the minority with that opinion - a lot of folks found something in the white album they liked and for diehard Weezer fans... hey, given what they've gone through over the past twenty years, all the power to them. 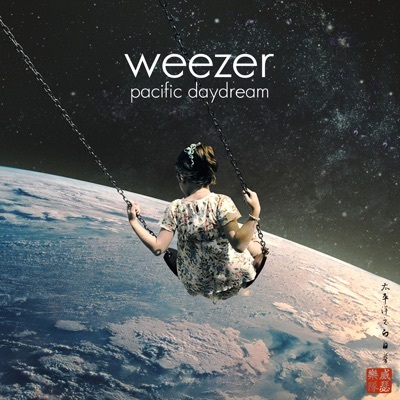 So it got me worried when I started hearing the buzz for Pacific Daydream - not just that it had resulted in the shelving of darker material for the rumoured 'black album', but also that it was a more sedate, pop-leaning record, which is about the last direction I think most Weezer fans want them to go. And to get there, they changed producers again to bring in J.R. Rotem and mega-producer Butch Walker, who actually has worked with Weezer before - on Raditude. And when it didn't look like even the critics were on-board this time, I was genuinely worried - and look, I'll never say I'm the biggest Weezer fan, but Rivers Cuomo knows his way around a really good hook. But considering the last time I heard Rivers Cuomo collaborate with a pop band in 2017 it was AJR's The Click, I had very little faith that his pop instincts right now. But okay, what did I find with Pacific Daydream? Honestly, it reminds me a lot of the projects that Weezer released in the late-2000s: languid, meandering, maybe peripheral to a few decent hooks or offbeat lyrical ideas but generally forgettable all around. You know, a record that might have picked up some play in mid-August in Southern California, but in late October early November will be roundly forgotten within a few days by everyone else, only this time updated for a modern audience by cutting in on the few reliable strengths that Weezer still has! I'm not going to say this record is outright bad or the worst thing the band has ever done - but it does feel a lot more disposable and pointless than a Weezer record should, and that's a problem. And for once it's actually pretty easy to pinpoint why, something that Rivers Cuomo has cited a lot in interviews leading up to this release: the Beach Boys. Cuomo has made it no secret that he's been a fan of this legendary 60s rock group, but where said influence on his writing mostly touched in sunny lyrics and rock-solid melodic hooks before, Pacific Daydream might be the closest he's ever come to openly trying to grab onto their style, with a collection of summer songs about lazy days, fleeting love, loneliness, and overdubbed vocal harmonies in order to recreate that classic style. Now I'm a big Beach Boys fan, and on my first few listens, there were moments I could hear the callbacks in chord structure and overall atmosphere, with 'Sweet Mary' being one of the best examples and high points on the album. Here's the problem: I've heard modern recreations of the Beach Boys that can stick the landing a fair bit better, and what can become alarming is how Weezer's pivot in this direction really doesn't stick the landing, simply because Weezer is, on a fundamental level, a very different band! You might not like Panic! At The Disco, but Brendon Urie's balance of old-school pop theatricality fits a Beach Boys impression a lot more than Rivers Cuomo imitating some of the vocal harmonies and running through a slew of wistful, painfully adolescent summer songs that with his tepid delivery sound increasingly half-assed. And that's the first part of the problem: while both Cuomo and the Beach Boys found success in earnestness, their writing came from a very different emotional core, with Rivers Cuomo firmly residing in a smaller, more introspective space full of nerd references and paralyzing awkwardness. And that's an attitude that rewards going for big emotions, not mellow meandering that feels increasingly listless as girls drift in and out of his life on the weekends like on 'Feels Like Summer' and 'Weekend Woman' and he can't find anyone with whom to do algebra on 'QB Blitz'. And there's always been some of that sense of arrested development in Cuomo's writing, and I'd like to think that his oddly tired delivery provides the subtext of seeing that youth-obsessed world pass him by... until you read his annotations on Genius and realize that subtext isn't really there. As much as he'll throw potshots at a cool hip-hop world while still worshipping the Beach Boys and dropping Monty Python references, there's little to no self-awareness. But it's the production that really lets Weezer down here, and the other major problem with emulating the Beach Boys: even before Pet Sounds, the Beach Boys were pushing the sound of rock into more complex directions, not watering their sound down! If you like that riff that opens 'Mexican Fender', it's about the only thing close to a vintage Weezer guitar lick you're going to get, because the electric guitar is then often isolated to the background behind gated drumwork, thicker basslines, acoustic guitars with the texture blasted away, and a mix that overall feels hazy and washed out. Seriously, 'Feels Like Summer' sounds like Ryan Tedder was producing a mid-2010s Fall Out Boy tune, and yet somehow is less interesting! I'll give points to giving these songs a foundation with the bass, but that shouldn't come at the expense of the melodies that made Weezer so distinct in the first place - they should be at the forefront, not mixed into a sandy blur that never builds any crunch or potency, and no, those buzzy segments tacked on the hooks of 'Get Right' and 'Any Friend Of Diane's' don't help! I'll admit it says a lot about Weezer that these songs are as passable and generally affable as they are, but with lyrics that feel thinner than ever and a lack of proper emphasis on instrumental melody, it's less summer love than a late-summer hangover. So look, I'm not going to say this is a bad record, but that's because Pacific Daydream is so blurry, insubstantial, and lacking the distinctive character of the best of both Weezer and The Beach Boys that it's not really worth actively disliking. For diehard Weezer fans... look, I honestly can't tell you if this'll be the straw that breaks the camel's back, given some of this discography, but if you want Weezer to make even passable pop rock this is pretty disposable and bland, pretty good songcraft ruined by bad production and Rivers Cuomo's refusal to engage with intensity or any sort of interesting lyricism. So yeah, light 5/10, and I can't really recommend it - but I'm being honest, the bigger issue is that in a day or two, I won't even remember it.